Organize and add additional power outlets to your rack solution. 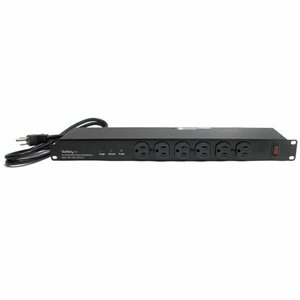 This 16-outlet (120V 15A)(12A UL) Rack PDU delivers a cost-effective power distribution solution for your server rack/cabinet. The 1U PDU can be mounted horizontally in any server rack 4in in depth or greater, to provide eight 120V 15A power ports/outlets, and features a rugged steel casing to ensure maximum durability.The front of the PDU features two LEDs that indicate proper ground and surge detection, while enabling you to control the power state with an illuminated power/reset switch.To prevent costly breakdowns of connected devices, the rackmount PDU features a built-in circuit breaker and reset switch, ensuring dependable performance of vital equipment. The front of the PDU features two LEDs that indicate proper ground and surge detection, while enabling you to control the power state with an illuminated power/reset switch. This 16-outlet (120V 15A)(12A UL) Rack PDU delivers a cost-effective power distribution solution for your server rack/cabinet. The 1U PDU can be mounted horizontally in any server rack 4in in depth or greater, to provide eight 120V 15A power ports/outlets, and features a rugged steel casing to ensure maximum durability. To prevent costly breakdowns of connected devices, the rackmount PDU features a built-in circuit breaker and reset switch, ensuring dependable performance of vital equipment.